By Fyodor Dostoevsky; Bantam Classic; First published in 1866; this edition published in 1981; 472 pages. The stakes are high for Dostoevsky as he contemplates writing this novel. It’s been five years since his return from exile in Siberia (1850–1860). He had been sent there as punishment for alleged subversion against Tsar Nicholas I. He spent four of these years doing hard labor. At one point, he was even led before a firing squad, but was pardoned at the last second. After his return from Siberia, Dostoevsky worked with his brother to produce two literary-political journals (you’d think he wouldn’t have wanted to touch politics after his stint in Siberia). In April 1864, his wife died of tuberculosis. His brother died a few months later. The journals failed, and Dostoevsky’s debts increased by the day. Hounded by creditors, in 1865 he wanted to leave Russia to find some peace in Europe where his ex-mistress, Apollinaria Suslova, was currently living and whom he wanted to see very badly. To raise the money, he obtained a loan from the Literary Fund. He also approached several periodicals with an idea for a new novel. So Dostoevsky took an advance from Stellovsky, paid his debts, and traveled to Wiesbaden, Germany. His plan was to replenish his funds by gambling what he had left. He lost everything. He could not even afford to eat. 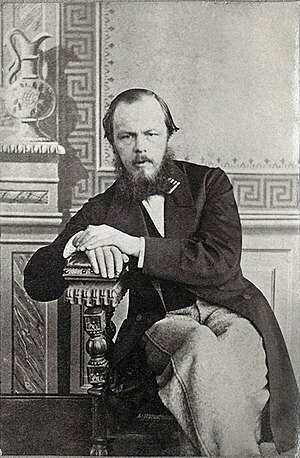 During this time as tension and desperation continued to build, Dostoevsky developed the idea for Crime and Punishment. He swallowed his pride and wrote to an old enemy, Mikhail Katkov, a powerful editor. He pitched the story, and Katkov liked it. Now Dostoevsky was indebted to two publishers. The introduction to my edition tells me all this and the whole plot of the novel (which I turned a blind eye to because I would rather experience it myself), but did not explain how Dostoevsky resolved these two debts. Leave it to me to fixate on something no one else finds interesting. And what happened with Apollinaria? Only three years before his imprisonment in Siberia, Doestoevsky published his first novel, Poor Folk. (Dostoevsky was born in Moscow in 1821.) His prison memoir is Notes From the House of the Dead. The name Raskolnikov is derived from the Russian word “raskolnik,” which means schismatic, and according to Wikipedia this alludes to the Old Believer Movement (Old Believers aka старове́ры or старообрядцы), which I don’t get because it seems like Rasknolikov was intended to be the poster boy for the new Socialist movement of the day. In 1652, Nikon, the then Patriarch of the Russian Orthodox Church, noticed discrepancies between Russian and Greek rites and texts and introduced ritual and textual revisions to create uniformity between Russian and Greek Orthodox practices. He did this without gaining consensus among the clergy. Those who did not accept Nikon’s changes were persecuted from the end of the 17th to the beginning of the 20th century as schismatics or Old Believers (Old Ritualists) (старообрядцы). Old Believers rejected all innovations and the most radical of them believed that the Church had fallen into the hands of the Antichrist. In 1666, the Church officially suppressed (anathematized) the old rites and books and those who wished to stay loyal to them, and stripped the Old Believers of their civil rights. Persecution, arrests, torture, and executions followed. I really don’t think that Raskonikov is supposed to represent the schism of the Church. At one point with Sonia (the 18-year-old girl who has been forced into prostitution as a way to keep her family from starvation, or worse), he questions the existence of God. I think, rather, that Raskonikov, was named for the schism between his motivations and his actions. He is driven by this idealistic view of what good is or should be and, because of this, views himself as above the recognized moral code of what is always good and always evil, allowing himself to believe that he is entitled, justified, even duty-bound to commit a crime if his crime would end evil actions of the one murdered. Or, maybe more accurately, it is the schism that happens when one believes with all one’s heart and soul that to do a particular thing is wrong, but does it anyway. Raskolnikov’s mother (Pulcheria Alexandrovna) and sister (Avdotya Romanovna) want desperately to help him escape his poverty, misery, and depression. (His father has already passed away.) In this society, it seems the only help from women can come from an advantageous marriage (one for money [in this case of Raskonikov’s sister to the “supercillious” Pyotr Petrovich Luzhin]) or through prostitution, a way to thoroughly and forever destroy a girl’s reputation. So basically, it’s condoned prostitution (holders of a yellow passport) or uncondoned prostitution (holders of a marriage certificate). Raskolnikov’s mother, at 43, is too old to be of any use. Dostoevsky indicates Raskolnikov’s feelings of helplessness with his gruesome and upsetting dream about a mare. Clearly, Dostoevsky has observed how stupid and cruel humans can be once they get an advantage over something that can’t fight back. Part I, Chapter VII is riveting. Every sentence was a tense extension of the one before it. I was on the edge of my seat. I haven’t read writing so thoroughly engrossing in years. Dostoevsky’s skill is phenomenal. The proofreader of my edition, however, should have been shot. I’ve never seen so many misspellings! And I suppose it’s the penny-pincher in me, but every time Raskolnikov gave away his rubles (typically to help someone else), I cringed. Writing this in his 40s, Dostoevsky demonstrates superb skill. He conveys time and space with ease. I am right there with Raskolnikov in his tiny room or walking in the street or along the Neva. I don’t see his face, but I’m in his head. I sympathize with him and yet I’m repelled. Dostoevsky pulls me back and forth as he examines Raskolnikov’s complex character from all directions. …if society were properly organized, all crime would cease at once. This strikes me particularly now as I have been reading about a different Russian, a billionaire Dmitry Itskov, and his idealistic (and rather terrifying) 2045 project aspirations. As humans use technology to achieve immortality, Itskov expects all of humanities’ problems will miraculously disappear. Are Itskov’s views a reincarnation of the socialist ideas present in Russia in the 1860s? These words seem hauntingly relevant today. Raskolnikov discovers that an article he wrote while a student has been published. In it, he discusses the psychology of a criminal before and after a crime. He suggests that some people have a right [even a duty] to commit crime. Ordinary people live their lives in a rut and stay there. They are inferior. They preserve the world and the people in it. Extraordinary people do not. They move the world and lead it to its goal. They have the gift or talent to utter a new word. For a minute they were looking at one another in silence. Razumihin remembered that minute all his life. Raskolnikov’s burning and intent eyes grew more penetrating every moment, piercing into his soul, into his consciousness. Suddenly Razumihin started. Something strange, as it were, slipped, something awful, hideous, and suddenly understood on both sides. One thing that always interests me when I read these types of stories, stories in which the reader is set up to judge the protagonist, is order. My impressions of Raskolnikov would have been different if I had learned more about his character before I was exposed to his crime. I would have felt more sympathetic towards him. As it is, I find myself struggling, which I think is exactly what Doestoevsky intended. It’s easier to forgive someone you know and love, but not so easy to forgive a stranger, even if you do know his thoughts. Then at last, there is the idea of redemption in suffering. I finished this novel on the same day that the leading story in the news was about the murder of Chris Kyle, the 38-year-old former Navy SEAL who wrote a memoir about his 150 confirmed sniper killings in Iraq. His wife explained on TV that he did what he loved. Both Kyle and Raskolnikov made the same decision about human life, though Kyle apparently was less bothered by it, but then I haven’t read his book, American Sniper. Sanctioned killing versus unsanctioned killing. It’s important, it seems, to get the rubber stamp. Was Raskolnikov’s deepest regret the self awareness that he was not, in fact, and extraordinary man? Several times in my life, I’ve been accused of thinking too much. I’ve always thought that was odd. I think now I finally get what that means. For the truth of things isn’t really so complicated. At the end, like at the end of Anna Karenina, we are left with the hint that our protagonist will make the conversion from atheism to Christianity. I loved it too, but I wish I had read a better translation. Some books from that time period seem so dusty and dated, but not this one. It’s still fresh. That’s awfully heavy reading for students so young. I think I would have rebelled. Did you enjoy them? Your blog posts and fabulous. I feel like such a lazy blogger in comparison – just whipping up rambling thoughts on my iPhone!! Big fan if this one as Crime and Punishment is a classic I have not yet conquered but I am now inspired too! Be sure you get the translation done by Richard Pavear and Larissa Volokhonsky. They are excellent. A bad translation can ruin the whole experience. I almost threw mine down to order a different one. Will take that advice and out it into action when I get my copy, thanks! This is what socialism is about. Socialism failed because it failed to understand the real world and failed to understand human nature. I agree. Idealism and a drive for perfection seem to have enormous risks. Some see the world for what it is (Laissez Faire) and some see the world the way they want to see it (socialists). But human passions never change and it is the yin and yang that creates the cycle. I returned to your blog to find that I had already liked this post. THANK YOU for the synopsis of the intro and a peek at Mr. D’s life — makes reading one of my favorites that much more rich. Thank you. I always say that I’m an intellllecctual but I hardly ever make it through the introductions (awake). “Ordinary people live their lives in a rut…They preserve the world and the people in it.